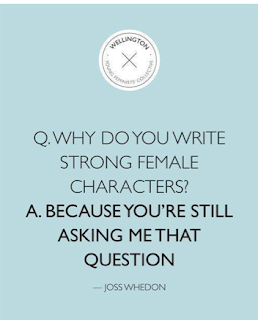 Instead of focusing solely on Buffy, I'm going to use this post to talk a little about Joss Whedon, the creator of Buffy. Buffy is not the only "badass" female character that he has created. In fact, strong women seem to be his favorite type. Whedon also wrote Angel, a Buffy spin off, Firefly, and Dollhouse among others. Many of his characters are strong females who have action roles including the protagonist of Dollhouse (played by Eliza Dushku or Faith on Buffy). Whedon said in an interview that if Buffy was inspired by any character, it was Kitty Pryde of the Astonishing X-Men. Buffy, like Kitty, was an especially gifted young slayer. The X-Men loved Kitty. She was like a daughter to Storm, and she managed to break through Wolverines rough exterior. Buffy became like a daughter to Giles, and family to Willow and Xander. She manages to break through Faith’s rough exterior, if only a little bit. Almost everyone who comes in contact with her grows to love and respect her. Buffy’s character is so much more than just a slayer, she is foil character for everyone who comes on to the show. And when Buffy goes through difficulty or is unsure of herself, the Scooby gang become foil characters for her. A lot of heroes are solitary and stoic. Buffy is stronger because she is brave, but not alone. Buffy actually does not desire to be a slayer. She does not look at it as a gift but more as a burden. This makes her more human and likeable compared to Faith, who is fascinated by her own powers and gets caught up. It's the nonchalant attitude of hers that attracts all of the goodness and good people to Buffy. Volkan, you make a very good point. It is her nonchalant attitude that brings goodness upon her. I also feel that this is the same for Willow; she is very low-key and focused on helping others, not herself. She is a foil character as well: she helps her friends when they are in need, and she is helped by her friends at her time of need (when she becomes the Dark Willow after "overdosing" on the magics).